Part of what makes Facebook such a powerful advertising network is that you can target such a specific group. 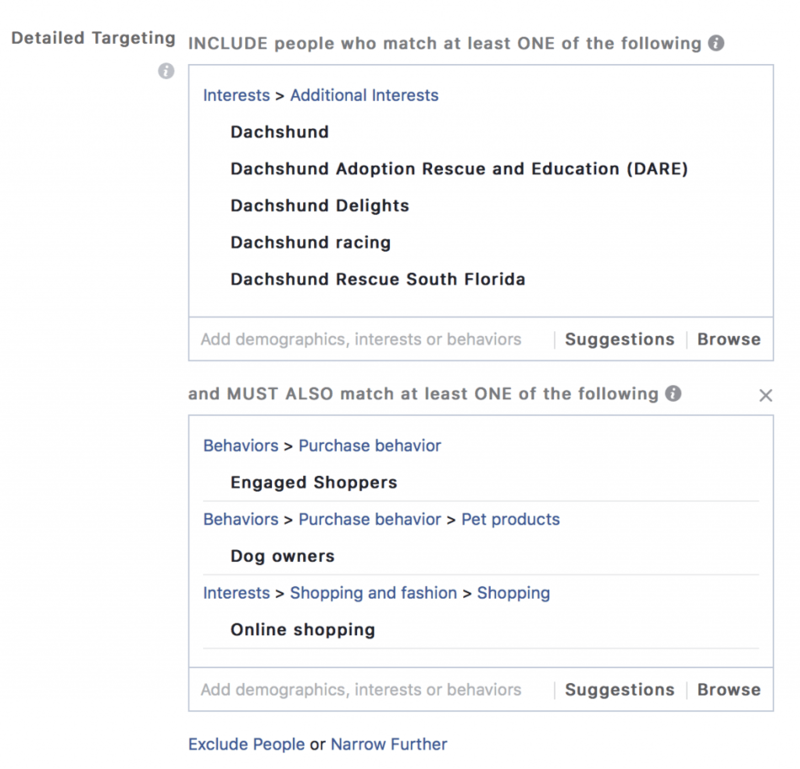 Facebook ads deep targeting helps you reach your specific audience. If you use the right combination of audience demographics, interests, and behaviors you can reach a very specific group of people. You can think of it like targeting a needle in a haystack. Facebook really knows a lot about its audience which is both creepy and great. I previously took a broader look at Facebook ad targeting but there is so much more you can do. In fact, advertising on Facebook without this level of audience targeting wouldn’t really be that great. The level of targeting Facebook allows is what makes it so powerful with ads. They know a lot about their audience because people tell Facebook a lot. Facebook takes what people tell it and then combines that with even more information. They combine it with financial data, buying history, and more. If Facebook is so smart and knows so much about people when why should you narrow your audience? Narrowing your audience effectively on Facebook is one of the only ways you reach the right people. When you reach the right people with your ad then your audience is more likely to engage with it. If I show an ad for dog bowls to somebody who’s not a dog owner then I’m paying for impressions that aren’t likely to get a click. You’re throwing away money if you don’t target your ads as close as possible to your ideal business audience. 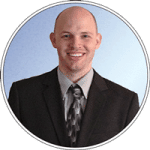 With the right targeting, you are going to save a lot of money. Your ad won’t show to people who definitely won’t be interested in clicking on it. If you’re on a budget with marketing dollars then this is important. With proper audience targeting and a narrow audience then you’re also likely to get better engagement with your ads. Better engagement on your ads means Facebook gives you better rates. An ad that gets good engagement can cost you half the price of one that doesn’t. Facebook only knows so much about who your ideal target audience is so it’s your job to tell it. That’s why Facebook gives you so many options for targeting. There are many different depths of targeting on Facebook. General targeting gives you some power and for some businesses, it might be enough. I like location targeting as an example of general targeting being enough for some businesses. If you’re a food place then this is a must use option. Of course, you have to know how to use it with the right ad, targeting times, etc. If you’re a new food place that just opened up near a lot of offices then you can target those people. You’d want to put your address in the location box, select everyone in this location, and put a very narrow distance radius. Time your ad right, say before lunchtime, with a special lunchtime deal you could bring in some serious business. Now you could even up the ante even more by targeting specific interests for your type of food. That’s just one example to get your imagination going too. The possibilities of location targeting for people traveling (people traveling in this location) is endless if you’re in the tourism industry. 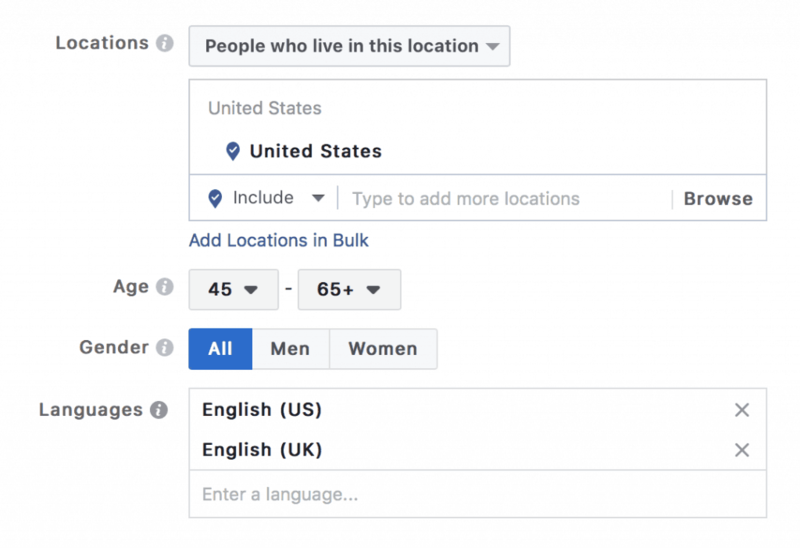 There are a lot of options when it comes to targeting your audience based on location, age, gender, and languages. For most businesses, the deep targeting isn’t going to end there though. You have to go deeper to get who you’re after. The targeting goes deeper than the general targeting options above. It needs to go deeper for most people advertising on Facebook. You’re simply targeting a too large and too broad of an audience with just location, age, gender, and language. The power starts to come in when you go into the detailed targeting. The first thing you need to do is narrow your audience with detail targeting. You can narrow using people’s demographics, interests, or behaviors. I will start here but get increasingly more complex in how you can target. This is the first level of narrowing you need to do. It’s a little more complex than the general options but it’s very helpful. You have to first know your target audience well before you can target them sufficiently. Is your audience small business owners? Do they own a house? How much money do they make? Answer every question you can about your audience and you’ll get a hint of how you should target them. 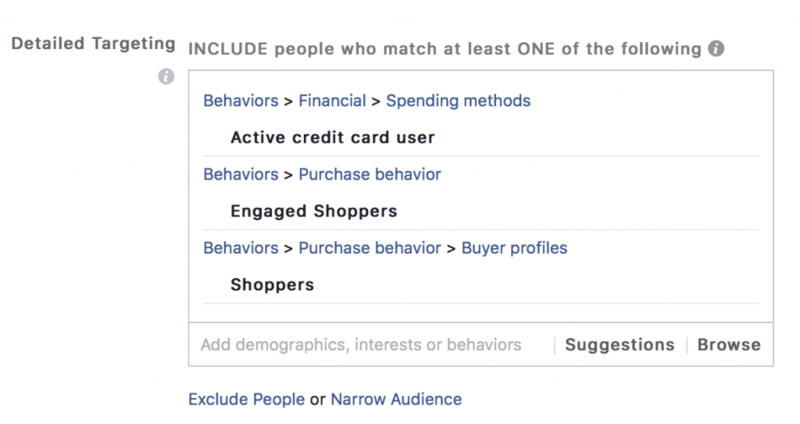 Right below the general targeting options on Facebook is detailed targeting. This is where you can search the demographics, interests, and behavior to find the right target audience. Each person that Facebook shows your ad to must match at least ONE of the items you target. That’s pretty easy to meet for most people. If you target people in this box who are business owners and make over $250,000 per year then really that’s two audiences. You could get somebody who makes $250,000 a year but isn’t a business owner. Hmmm, that isn’t so good for your targeting if Facebook will pick ANY of the details you put in about your audiences. That’s why you have to go deeper down the rabbit hole of targeting. It can go as deep as you need in order to get the right group for your target audience. Before you start narrowing your audience even with the first options, you must group your target options together. These groups have to make sense in a way that they’re all related. If I’m looking for business owners or people interested in running a business but make over a certain amount per year, I’ll group those separately. One group will have things like small business owner, entrepreneur, small business, etc and the other group will have the income level(s) they need to have. With that in mind, it’s time to narrow your audience to maximize your Facebook advertising effectiveness. 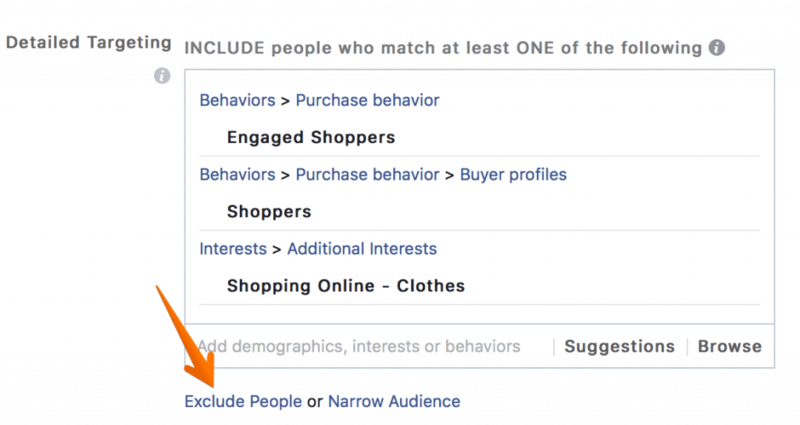 After you add some of your primary targeting options you’ll need to click the Narrow Audience option below the first targeting box. Another targeting box will be added below the first one that looks identical. This is where things get really interesting. See how I have a whole bunch of interests in the first box? Those are all people interested in Dachshunds. Just because they’re interested in Dachshunds doesn’t mean they own a dog though. Well, I also wanted to target those who are likely dog owners based on their purchasing behavior. Now here’s where things are a bit wrong in the screenshot above. The first and third options (of the second box) should be in their own interest box. That’s where I’m able to narrow even further. You can keep clicking that Narrow Further link to add more targeting boxes. This way, the Facebook audience must meet at least ONE item from each box. Ideally, I would have placed Engaged Shoppers and Online shopping in their own box. I could have perhaps added a few more items in that third box with purchasing habits in it. That’s a pretty good target audience if you want to go for dog owners who love Dachshunds and buy products online. See how I narrowed down my audience to a very detailed segment of Facebook in one simple sentence? You can explain who exactly you’re trying to target in one sentence and then break it down one by one. Eventually, you’ll get the perfect audience that Facebook can’t just pick one target item out of. I don’t know if there’s a limit to how much you can narrow but I got 10 deep and Facebook would let me keep going. There’s more than enough options for you to target very deep on Facebook. More than enough. You can narrow your audience with items they should match but you can also exclude people. Anywhere in the mix of targeting groups, you can click the Exclude People option to add another box. This time the box will be to exclude people who meet certain demographics, interests, or behaviors. If you know your target audience does not have a specific interest or trait then you can use this option to absolutely exclude them. There are a lot of options to think about in order to best reach your target audience. You can get creative with all the options Facebook gives you with ad targeting. You used to be able to get more creative but Facebook is always experimenting with targeting abilities. At one time you used to be able to target one specific email address, they pulled back on that because you can imagine how creepy that could get. You also used to be able to target people’s last names, that’s no longer an option. Even with all the targeting options Facebook has removed over the years there still remains a lot. 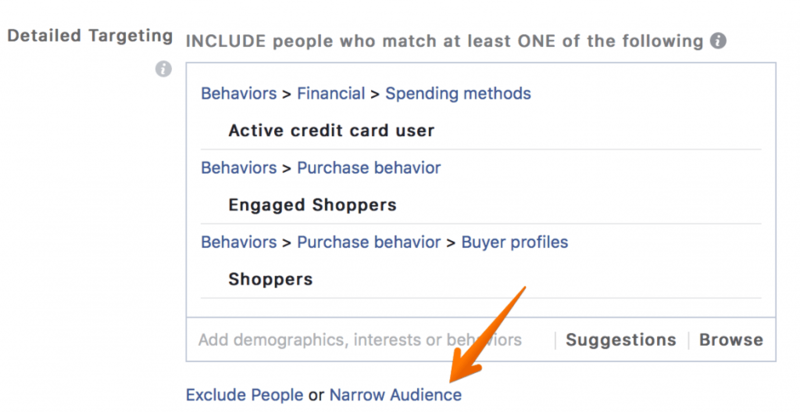 By narrowing your audience down and excluding some people you can get a very specific target audience on Facebook. If you use a good Facebook ad strategy with the right audience then you can achieve a lot. If you’d like to talk about how you could effectively target your audience on Facebook then you can schedule a free consultation.